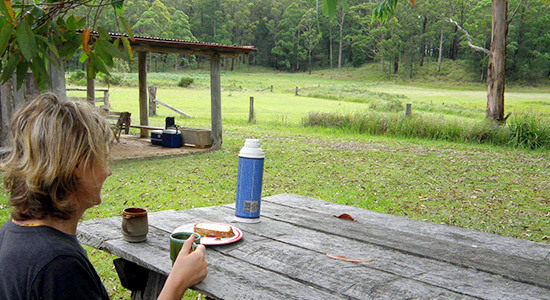 Take time out in a self-contained eco-cabin, bunkhouse accommodation or bush camping in the forested mountains at Mount Royal in the Barrington Tops in Australia’s Hunter Valley. Callicoma Hill is an ideal bush getaway for families, couples, friends and groups. 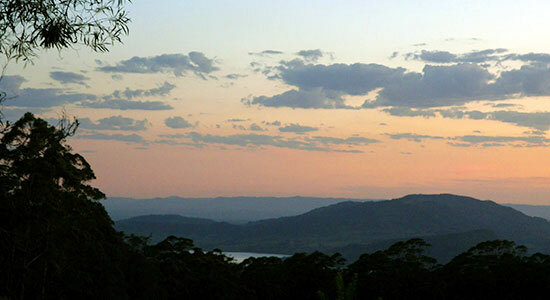 We offer peace & quiet, a mountainside of forest, 80km views across the Hunter Valley and fresh mountain air. Most importantly, guests have exclusive use of our property so you don't have to share with other visitors. About 3 hours travel north of Sydney near Mt Royal and Barrington Tops National Parks, this area of world heritage rainforests and wilderness north of Singleton is about 1 hour from the famous Hunter Valley vineyards. At Mount Royal you can bushwalk, see native wildlife and relax. Activities nearby include mountain bike riding, scenic views, and fishing or boating on nearby Lake St Clair. Callicoma Hill offers you a memorable, authentic and environmentally sustainable experience. Find about the eco-cabin, bunkhouse and camping, the facilities, location, bushwalks and activities. Contact us now to discuss availability and booking a nature getaway.